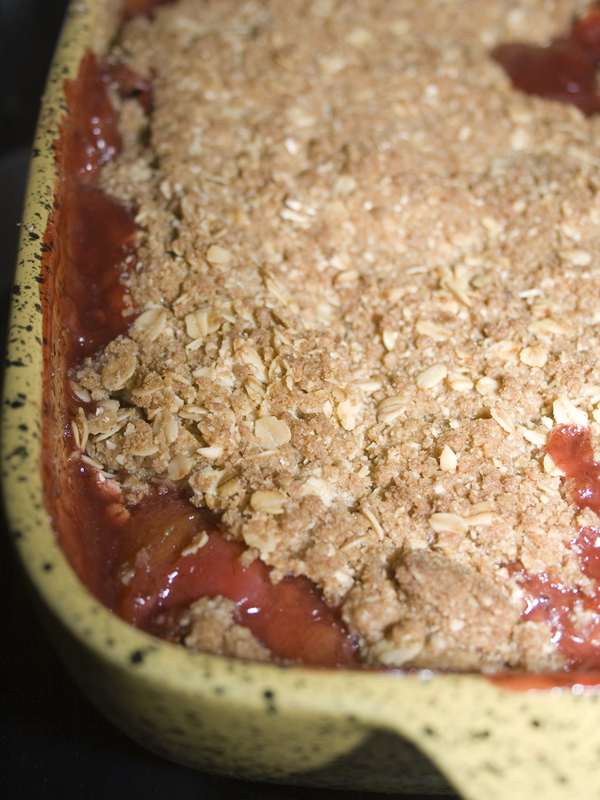 Some of my fondest childhood memories involve rhubarb. Actually, they revolve around my grandfather (who I called “Poppa”), his cabin, and the rhubarb that grows by the laughing creek that runs the length of his property. My cousins and I established lifelong friendships in the field at the cabin. I learned to play volleyball and horseshoes there. I rode my first snowmobile, horse and tractor in the stubby grass around the property. Long afternoons were spent laughing and splashing in the icy waters of the creek, building a dam to create a swimming hole and playing Pooh sticks off the bridge. Occasionally, we’d hike up the hill to watch the sunrise over the snowy peaks of the cascades. The first rays of daylight streaking across the valley in the morning stillness was idyllic in every sense of the word. I spent so much time at Poppa’s cabin as a child that I sincerely believed I was a resident of his small community in Leavenworth. When a neighbor girl called me a “tourist”, my indignant 10-year-old retort was “I am NOT!”. I know, not the greatest comeback ever. I’m pretty sure at the time I didn’t even really understand what a tourist was. Just that surely I wasn’t one. 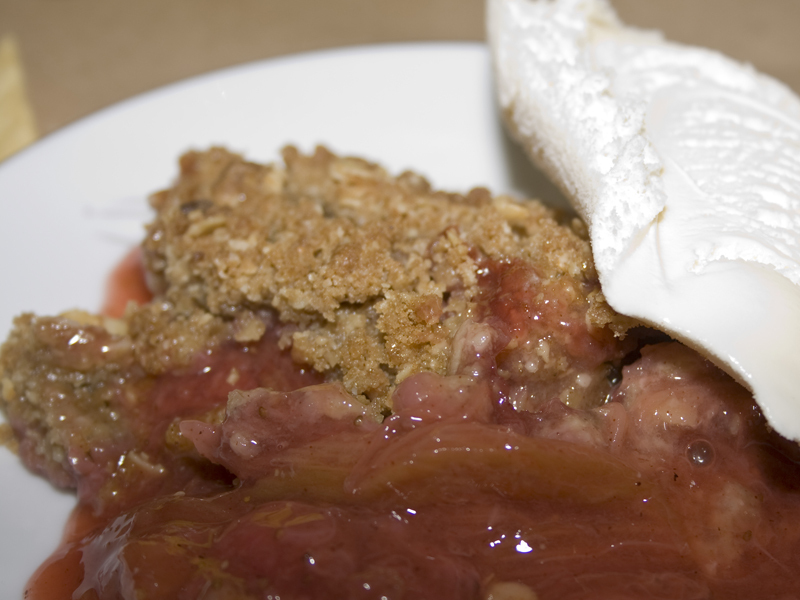 Every visit to the cabin in the summer ended with my mom gathering rhubarb to take home and turn into this amazing dessert. It was never long before we’d head back over the mountains bringing some of this crisp for Poppa. It was his favorite. I’ll never be able to eat rhubarb crisp without thinking of his powerful presence and the beautiful haven of childhood he created at his cabin. Sometimes meals are more than just food. Sometimes, meals are a memory. Heat oven temperature to 375°F. Combine 2/3 cup oats, flour, sugar, and cinnamon in processor. Add butter and cut in until crumbly. Transfer mixture to medium bowl. Stir in remaining 2 tablespoons oats. 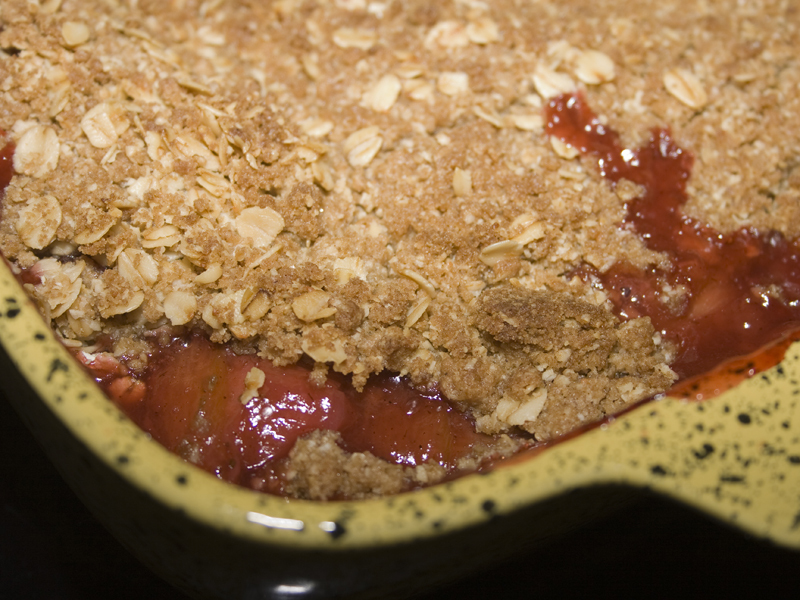 Mix rhubarb, strawberries, sugar, cornstarch, cinnamon, and nutmeg in heavy large saucepan. Let stand 30 minutes. Bring to boil over medium heat, stirring constantly. Reduce heat and simmer until juices thicken, about 3 minutes. Pour filling into deep dish pie pan. Cover with topping. Bake 20 minutes. Bake until topping is golden and juices bubble, about 35 minutes. Cool on rack. Serve warm or at room temperature. This looks sooo good. I am so glad its crisp season!! Me too! Best season there is!